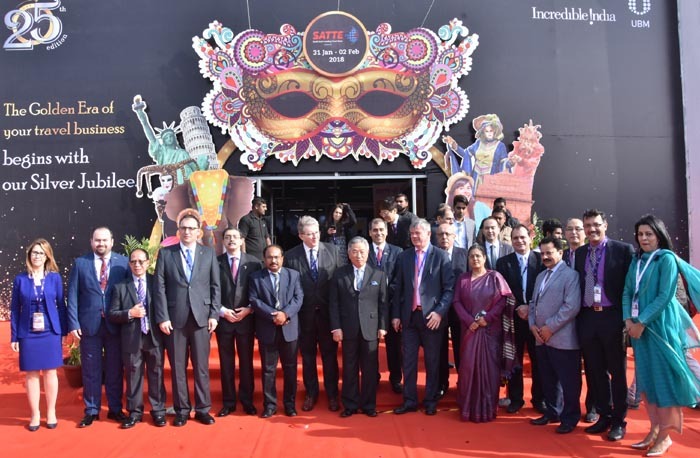 Mumbai, January 31st 2018: UBM India launched its most awaited travel and tourism exhibition, SATTE, in the national capital today. Celebrating the success of the Silver Jubilee edition of SATTE, South Asia’s leading travel and tourism exhibition, the three day event plays host to over 1,000 exhibitors and represents over 50 countries and 28 Indian states. The expo got off to a start with a ribbon cutting ceremony by Mr. Yogesh Mudras, Managing Director, UBM India, Ms Pallavi Mehra, Group Director, UBM India, Mr. Jime Essink, CEO, UBM Asia and Mr. Michael Duck, Executive Vice President, UBM Asia at Pragati Maidan among others, in the presence of an august industry congregation. As a prelude to the inauguration, the Silver Jubliee edition of SATTE was formally launched along with the second edition of the SATTE Awards on January 30 at Le Meridien New Delhi amidst an august industry gathering from the travel and trade fraternity. The glitterati event was graced by Chief Guest Mr. KJ Alphons, Minister for Tourism (I/C), Govt. of India, along with Mr. T.S. Rawat, Chief Minister, Uttarakhand; Mr. Amitabh Kant, CEO, NITI Aayog; Mr. Faiyaz Koya, Minister for Industry, Trade and Tourism Fiji; Mr. I Gde Pitana Dy. Tourism Minister, Indonesia; Mr. Bo Keun Choi, Senior Officer, Regional Programme for Asia and the Pacific, UNWTO; Mr. Subhash Goyal, Member, National Tourism Advisory Committee; Mr. Navin Berry, Founder, SATTE; Mr. Michael Duck, Executive Vice President, UBM Asia and Mr. Yogesh Mudras, Managing Director, UBM India. Over a span of three days, SATTE 2018 is set to witness several exciting partnerships and announcements that promise to augur in new trends in the industry. Visitors at the signature expo witnessed a number of features including a special pavilion of 10 start-ups, as well as a live show at ‘Colors of SATTE’ apart from other captivating engagements. This year, SATTE was also happy to engage its exhibitors and visitors to pledge for sustainable tourism under the unique I-Pledge initiative where they pledged to conserve natural reserve; respect and save wildlife; say no to plastic; dispose waste smartly and travel responsibly. Over 30,000 pledges have been registered at last count. “From hosting tourism boards from across the nation and the world under one roof to providing a unique opportunities for discussions pertaining to trending subjects like sustainable tourism, travel technology, skill development by acknowledged industry thought leaders, SATTE has carved a unique place as the most comprehensive industry platform in the country. This year, we are proud to achieve a milestone with the Silver Jubilee edition of SATTE, celebrating and encapsulating 25 years of success in the domain. With an aim to analyse and forecast trends and developments in the travel trade industry along with helping businesses prosper, SATTE 2018 promises not only constructive but also informative and engaging three days”, he further added. From Maharashtra, Gujarat, Rajasthan, Madhya Pradesh, Jammu & Kashmir, Goa & Odisha and Himachal Pradesh to Andhra Pradesh, Telangana, Karnataka, Kerala, Punjab, Uttrakhand, Delhi, Jharkhand, Andaman and West Bengal, SATTE 2018 featured an array of State Tourism Boards, with many of them increasing their presence at the 25th edition. The eight North Eastern states have participated in the Incredible India Pavilion of the Ministry of Tourism, Govt. of India. As far as NTOs are concerned, Spain, Peru, Czech Republic, Ho Chi Minh City, Singapore, Hong Kong, Macau, Turkey, Philippines, Japan, South Korea, Fiji, New Zealand, Nepal, Bhutan, Bangladesh, Azerbaijan, Egypt, Israel, Sharjah, Dubai, Sri Lanka, Thailand, Malaysia, Taiwan, Mauritius, Indonesia, Abu Dhabi, Visit Russia, Visit Florida and Las Vegas and Oman, amongst others showcased their destination and launches. SATTE 2018 witnessed the return of Taiwan, Mauritius, Bangladesh, Philippines on the floor. While Turkey, Thailand, Srilanka and Dubai are Partner countries, Mauritius and Madame Tussauds are feature destination and feature attraction respectively. Similarly, Gujarat, Madhya Pradesh, Rajasthan, Maharashtra, Goa, Odisha and Jammu & Kashmir are Partner States for this year with the show being supported by the Ministry of Tourism, Govt. of India. One of the key features of SATTE 2018 is the conference programme on all three days of the expo that promises industry discussions and sharing of new insights pertaining to the sector and industry best practices. During this time, SATTE is hosting six panel discussions that will bring together stakeholders of the industry on a single platform, allowing exchange of ideas that will add value to Indian tourism at large. The sessions of the conference touched on topics such as – ‘How to realize effective collaboration between stakeholders for sustainable tourism?’, ‘How can we achieve the successful journey to 2030?’; ‘Visa Reforms & Tourism Growth’; Travel Technology; MICE, Cruise Tourism and Niche Tourism, to name a few. The three day conference will also see destination presentations by tourism boards such as — Czech Tourism, Egypt, Dubai, Ho Chi Minh City, West Bengal; a product presentation by Tragly and a Workshop and a panel discussion on Skill Development in the Hospitality Sector. 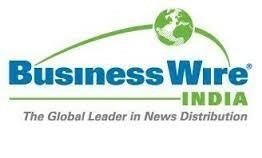 “Statistics show that more tourists visit Singapore & Malaysia but the truth is that India is a long haul destination. 97.2% people come to India by air and the average stay is 14-20 days — one of the highest duration for travelers around the world. Therefore, India’s earnings from tourists are much greater than many of the other countries etc. Of course, it is up to us to make this duration extremely attractive and rich in experiences. And that’s where an exhibition like SATTE comes to the fore with its reserves of ideas and thought leadership. plc which is listed on the London Stock Exchange. UBM Asia is the leading exhibition organizer in Asia and the biggest commercial organizer in mainland China, India and Malaysia.